Beaducation: The Blog: Resin Resonates with the Beaducation Team. Resin Resonates with the Beaducation Team. The Beaducation Education Team is one lucky group. Not only do we get to interact with some of the best teachers in the business, we are the first to get to see their classes while we are filming. We are always fired up after a shoot since we have been up close and personal with a new technique presented by a world-class instructor. We all had serious resin-on-the-brain when Instructor Debbi Simon came to shoot her classes. If her first class, FREE Bezel-Bezel Resin Techniques didn't get us into enough of a frenzy (which it did, BTW) then her second class, the recently launched Mold It, Cast It pushed us over the edge. As we were discussing her class the other day after launch (and lunch), we realized since we had all the stuff to try it out, one of us should really mold and cast something to check out the process. Aisha jumped into action. 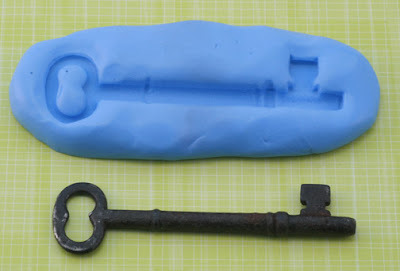 She had the perfect mold-able object; an old key. 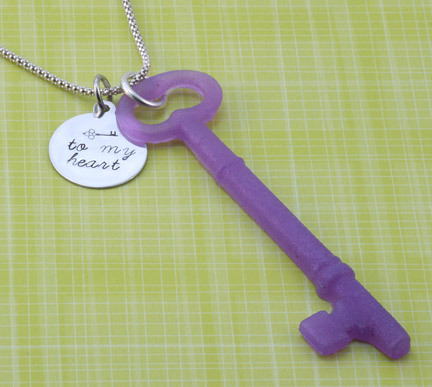 (Who doesn't love a key!) She sat down one afternoon and created along with Debbi. She started by making a mold. So far so good! Can you see that detail that the molding material picked up?? Then she mixed some resin and tinted it with some acrylic paint. She started by adding just a bit of color until it looked just right. She poured it into the mold and let it sit undisturbed for 12 hours. Then popped it out of the mold and and voila! A perfect replica. She decided to keep the matte finish just as-is right out of the mold. Aisha expertly stamped a silver blank and strung it all on a sterling silver chain. We just love how it looks! When I hollered out to Aisha to ask what words she would use to describe her experience with Mold It, Cast It, she replied "It's fun, easy and has endless possibilities." It sure does and we all can't wait to try it out. We are tucking the mold away to try again when Debbie's next class "Resin Foundry" launches. 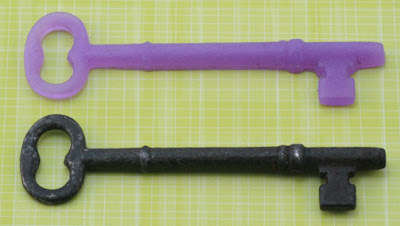 It's all about casting with bronze powder and the results look just like cast metal. Give it a try and let us know what you think. Do you have any resin tips to share? This is amazing! It sounds like so much fun! I can't wait to see the what comes next. That's awesome! I can't wait to get to work on some resin projects! 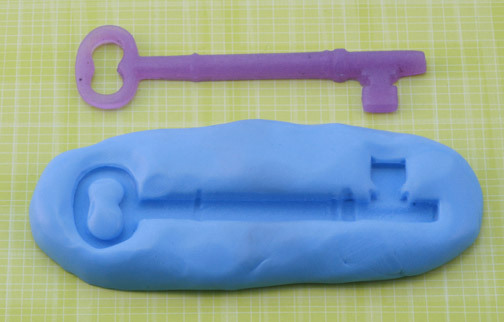 I'm wondering if the mold makes just the bottom of the new key rounded but the top flat? Or vice versa. In other words, is this flat on one side? That's what I'm trying to ask! Ha. Thanks. The key is flat on the back side. You could make a mold of each side of the key and then epoxy them together. Debbi shares that technique on in her Mold it, Cast It class. That would look super!